It is not often that I will write about a specific business. I prefer to write about the principles within, however sometimes the principles and the business match beautifully. We spent the last week enjoying the final days of summer in a campground named Pacific Playground which is just south of Campbell River in an area known as Saratoga Beach. 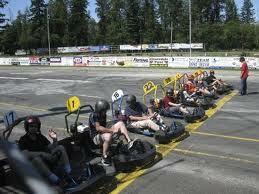 One of the attractions in the area are the go-karts at the Saratoga Speedway. They are open from noon until 4pm and once you are on the go-kart you feel like you are racing Formula 1- this part is well worth the money ($10/10 laps). The drawback is the crusty old man that operates the go-karts. This old beast seems to feel that not only is he there to ensure everyone’s enjoyment and safety but also how to raise ones children. Your role, my friend, is to insure that we safely got a return our entertainment dollar… Period! Here is a link to their website and telephone number… by the way the voice you hear on the voicemail is Crusty’s. You are currently reading Saratoga Speedway at Dorkuncorked's Blog.